Confederations of African Football (CAF) President Ahmad has confirmed that Cameroon is still in line to host the 2019 Africa Cup of Nations (AFCON). Ahmad was quick to stifle rumours that had spread through social media that CAF had plans to take the continental tournament away from Cameroon. According to BBC Sport, next year's Nations Cup is set to be the first to feature 24 teams and will be hosted in June and July rather than earlier in the year as was previously done. Speaking during a meeting with Cameroon President in Yaonde on Tuesday, October 2, Ahmad said that Cameroon was doing everything in its power to ensure all was set. "President Biya has given us the assurance that he will give all to ensure that all the projects are completed on time,"
Present in the meeting was former Indomitable Lions captain Samuel Eto'o, who Ahmad thanked for his commitment to ensuring that plans for AFCON went on as proposed. "This meeting with President Paul Biya was for us to clear the air over recent stories that circulated the media that Cameroon were going to forfeit the organisation of the 2019 Africa Cup of Nations,"
"CAF has no plan B, CAF has never had any plan B and we have never thought about striping Cameroon of hosting rights of the 2019 Africa Cup of Nations,"
Questions have been raised over Cameroon's readiness to host the tournament especially considering the political unrest facing the nation. "If they're ready, we organise the event. If they are not ready, they can ask us to give them more time. It is up to Cameroon and not CAF," he clarified. 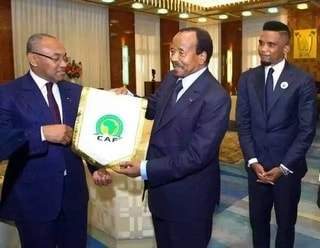 According to CAF's official website the Head of State's request for Cameroon to gain full ownership of the CAF Excellence Centre in Mbankomo was accepted. Two further inspections visits will be done in the coming months to ensure the stage is set for AFCON 2019.